From the Publisher's webpage: ...When it became apparent to Jon Stewart and the writers of The Daily Show that the world was about to end, they embarked on a massive mission to write a book that summed up the human race: What we looked like; what we accomplished; our achievements in society, government, religion, science and culture -- all in a tome of approximately 256 pages with lots of color photos, graphs and charts. 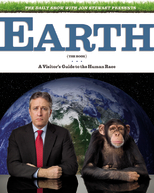 Jon Stewart's newest book, Earth, is fashioned as an encyclopedia of human history and life on Earth. For aliens. For student aliens. Sort of a travel guide to help aliens figure out what went on in this strangest of locations. He starts big, covering topics from Location and Weather, to Life (in all its forms), Basic Needs, War, Entertainment, Religion, and Medicine. It's similar to any encyclopedia a kid may have, except it's not for kids. It's filled with snarky humor, bitter irony, and more than a few awkward moments. He (and his team of writers) dish on everything with the trademark Daily Show kind of humor. For example, in discussing the extinction of the T. Rex, it says "couldn't reach heart pills stashed on top shelf". Regarding skunks and their possible evolutionary adaptation: "Skunks emitted a powerful scent to let potential predators know that they had just been hit by a car." Camera-replaced camera, film, lenses, standards for what constitutes a photo. Chipoto-potty-directed user to bathrooms within 100 years of the Chipotle they just ate at. And finally, it remarks "the Iphone could do almost anything except love you back". In discussing Entertainment, it explains for its extraterrestrial readers, "The two most basic modes of storytelling were comedy and tragedy. Tragedy allowed an audience to feel a charater's pain. Comedy allowed an audience to heartily enjoy a character's pain. Both modes originated in ancient Greece in plays featuring protagonists and antagonists, along with a large chorus so the less talented kids could participate." It is clever, and a few places had me giggling. A few places were shockingly offensive, even with the sarcasm in place. Visual plays on brand names, famous events, and celebrities are amusing. Sprinkled throughout are quizzes and scavenger hunts called "Earth Search", as well as some sample forms for aliens to understand the HMO application process. Some of the photoshopping and conceptual ideas are beyond inventive: The Periodic Table of the Synthetic that adds Axe body spray and Tang to the list of mankind's important chemical substances is epic. So...did I like it, beyond the laughs? The thing about Jon Stewart that I've always enjoyed is the topical humor in terms of current events-his take on politicians, laws, and world news. This was more pop culture history, and while funny, I can't imagine that even a resident of Earth would get some of the humor just a decade from now. It's sort of like reading the stories in a Reader's Digest-a cute little paragraph that makes you smile but you forget five minutes later. In other words, despite the underlying message of just how messed up the world is, there's really no clear focus beyond the irreverent* humor. 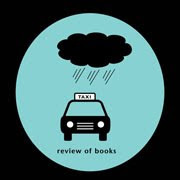 Special thanks to Kelly Leonard of Grand Central Publishing for the Review Copy. This title was just released. I think my son wants this book for christmas. It sounds like it wasn't quite as good as his first one. How old is he? This is heavy on obscenities, innuendo, etc. An imaginary naked Larry King is also rather disturbing, I threw up a little. Just ordered this - and can't wait. I'm a huge Daily Show fan. It's delightfully irreverent! ;) What I love about Stewart's comedy is the mix of high and low brow. It's pitch freakin' perfect for these disaffected, sarcastic times. Right?! Thanks for using the word irreverent in your post, Greg. And who is disaffected and sarcastic, seriously? Have looked at this one so many times. I love the Daily Show. YOu might have pushed me over the edge to pick it up. I'm going to add your blog to my nonfiction blog roll. You have some great stuff here!